Being a in the beginning stages of puberty Kauzu stands at 5`5 and weighs in at 120lbs. Though young, his body is well filled out with appropriate amounts of muscle for a ninja his age, especially being a Taijutsu specialist. With ebony hair that is in an unkempt bowl-cut -slightly longer in the back-, the boy has not a single blemish upon his youthful energizing visage. His clothing consist of a dark blue kimono shirt covered by a short light-green jacket. With a white scarf around his neck, his look is complete with a pinstriped pair of kimono pants and a dark green sash. Personality: Kauzu can be depicted as a very light hearted and carefree person. An upbeat tone naturally carrying his words, this same upbeat attitude carries his body throughout his daily motions. He has an immensely strong work ethic and tries to push his peers to train as much as he does as he is aware he has a clan name to uphold. Very chauvinistic with the blood that flows through his veins, Kauzu is quick to lash out at any foul talk against his clan or anything that involves such things. Being in a clan that doesn't harbor a unique Kekkei Genkai, has only worked to push the young Sarutobi to make up for lack of such an ability. Competitive and rivalrous, the Genin tries to make a competition out of almost anything he can and it often lands him in trouble when in casual settings. Excitable and boisterous, his presence is like that of a grown man how he talks and interjects himself into the business of older shinobi and people, often giving his unwanted and laughable input. Headstrong and one who follows his heart, many say Kauzu is destined to become a great leader of a nation or as he sees it his clan, if his stubborn personality doesn't get him killed on the way to such a dream. History: Kauzu was born into the Sarutobi Clan, but a branch that had migrated and found refuge in Kumogakure. Raised as the youngest of 3 other boys, Kauzu felt he was always behind and felt he often needed to work harder to put in equivalent work as to what his siblings were doing. May it be housework, eating, training, even studying, Kauzu never wanted to be in last or the one who did the least amount of work. This did good to give him an early start and a slight advantage over others in the ninja academy when he entered. Not one for the mental aspect of shinobi teachings however, Kauzu's full potential was never reached in the classroom setting of his shinobi training, as to where the field aspect he excelled well ahead of others. 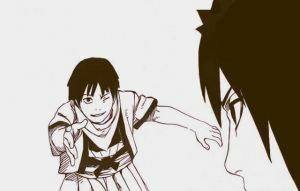 Soon enough as the years passed and the other students naturally progressed to become his equals Kauzu found his old competitive tendencies peeking and it gave birth to a shinobi full of potential and various marks on his record for random mischief. Graduating to the rank of Genin on time as others did, Kauzu now feels obligated to do the Sarutobi Clan justice and attain his full potential. Description: Using fire nature chakra the user boosts off towards their desired location may they be airborne or on the ground. This can propel the user a total of 10m and is primarily used to deliver a devastating tackle. The flames are naturally expelled from the feet, but can come from other locations as well and do no damage as they are used only for propulsion. Description: Using fire nature chakra, the user heats up their body to where small strands/plumes of flames harmlessly burn off their body. More of a supplementary technique, for Taijutsu augmentation, the user is now moderately faster having heated up their muscles and using small streams of flames behind their attacks to further propel them. This last for 2 post. If used along with Iron Body due to the strain on the body and chakra network, Kauzu can only sustain both for 1 post. Description: Using chakra as a coating, the user hardens a face of their body (back,right,left, or front) or a specific limb. Primarily used defensively, the chakra coating also makes blows hit harder. Last for 2 post. If used along with Devil's Dance due to the strain on the body and chakra network, Kauzu can only sustain both for 1 post. Description: Only usable on those of equal rank in a PvP setting, this is a simple chakra enhanced Taijutsu reversal. The only catch is that it requires a defensive stance that must have been assumed prior to the attacks landing. The stance is similar to the Hyuuga Clans gentle fist passive stance, palms open and knee slightly bent. Once the incoming attack(s) are successfully dealt with, the user attempts a grapple while using chakra to slightly enhance their bodies speed and strength. The augmentation of chakra virtually giving the user the upper hand, depending on the target's last strike attempt, the user goes for a takedown or strike oriented counter. Once used or attempted the technique goes on a 3 post cooldown to avoid exploitation.